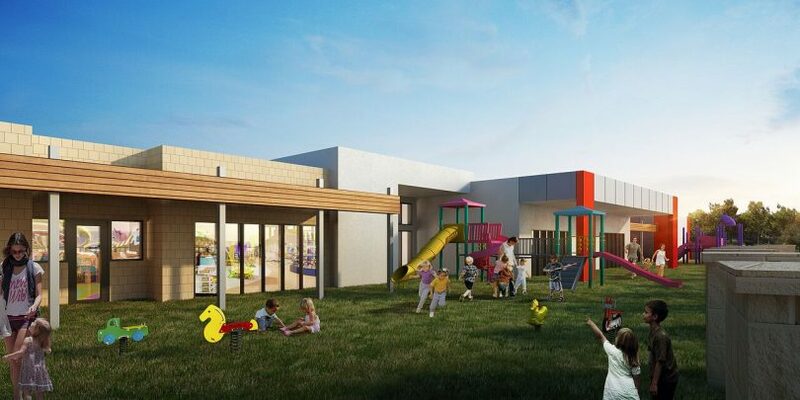 The Molonglo Valley’s long-awaited first shopping centre in Coombs may open by the end of the year with retail tenants now being sought. Burgess Rawson Canberra managing director Guy Randell said negotiations were in train with a major supermarket and liquor store operator, while expressions of interest were being sought for nine other tenancies, including cafes, restaurants, a gastro pub, hair and beauty salon, and newsagent. Mr Randell said the building itself could be finished relatively soon but the intention was to finalise tenancies and designs and open all the shops together. Mr Randell said the potential supermarket tenant was “really good” fresh food operator and an established independent brand from outside Canberra. It would anchor the shopping centre on a 1000 square metre site. A Chinese or Thai restaurant was being sought for the centre’s outdoor dining area, which will have external access so operators can open whenever they wanted. The wellbeing centre next door already has a medical centre, pharmacy and child care centre confirmed, with five of 11 tenancies left to fill including a gymnasium under negotiation. The health and wellbeing centre will have a medical facility and allied health services. The centre still needed a dentist, small imaging facility and other ancillary professionals but it should be delivered by the end of the year. The shopping centre will have 127 parking spaces, while the health and wellbeing centre will have more than 200. Child care will be an important part of the health and wellbeing centre. But Mr Randell said the whole development’s central location meant it would be a walk away for most people. The project had been on the drawing board since 2015 but only got the go-ahead in 2016 after two development applications were rejected and improvements made to the design. It will serve the 2600 residents of Coombs and Wright, while Molonglo will eventually be the home of 55,000 people. 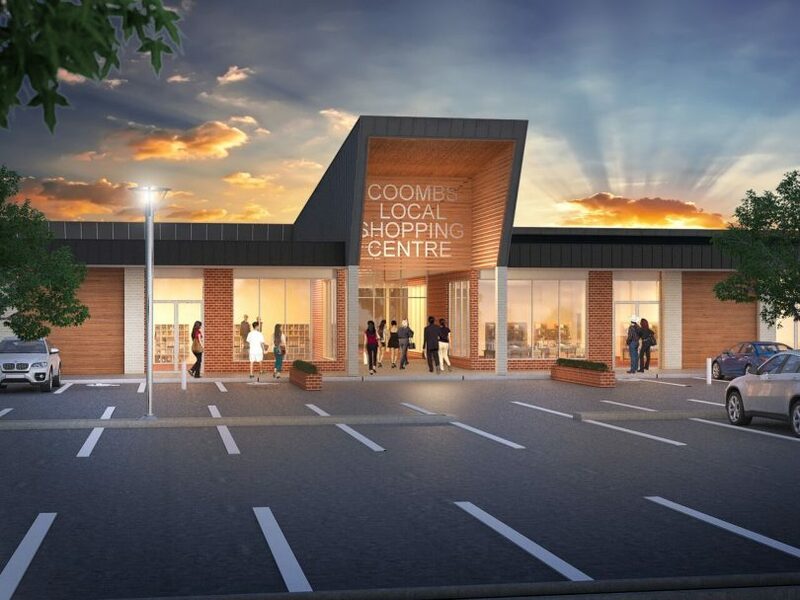 There is still no indication when the Coombs Shopping Centre will open for business. Large “For Lease” signs adorn the unfinished building. “Coombs Community Local Shopping Centre. Established by Renato Cervo 2015” . This is just plainly insulting to the local community. All it needs now is a white concrete lion on each side of the driveway. What an unmitigated disaster. Good to see at least one business opening soon and it will be followed by others, but none of them are in the supermarket complex which still doesn’t seem to finished. The service station complex up near the RSPCA also appears to be making sluggish progress. I’m guessing the 1500m2 is the total for the non residential part and may include a small “supermarket” (perhaps a Seven Eleven) and other retail/business spaces. Even so, it does seem odd to have two supermarkets across the road from each other. Perhaps this may be the push needed to make the developer of the Coombs supermarket wake up and do something. Or perhaps it may be the complete death of the Coombs complex. The first business that is opening in Coombs and Wright appears to be a gym, Club Lime Coombs on 28 February 2018. The structure is now essentially completed, but the real estate listings for this site indicate that all tenancies are still available for lease. What happened to the Sydney based supermarket who was negotiating to move in? Gowrie pharmacy was established under older pharmacy location rules when pharmacy licenses could be sold and moved around. The current pharmacy location rules came into effect on the 18th of October 2011 and strictly control where a new pharmacy can be established. There is a large pharmacy at Gowrie shops next to a small supermarket. The closest large supermarket is Coles at Chisholm about 1km away. As you say, if the Facebook page is to be believed. Unless the Federal regulations have changed since the Gowrie pharmacy was built. Federal regulations will only allow a pharmacy in such a suburban location if it is within 500m of a supermarket greater than 1000 square metres. ACT regulations will only allow a supermarket in such a suburban location if it is 1000 square metres or less. Unless the Federal regulations have changed recently it seems that the ACT government has again proved to be incompetent. I wonder if Bec Cody or Chris Steel are willing to comment, or if they will wash their hands of it like they did last time the size an viability of the Coombs supermarket was raised. The ACT government has rejected an application for a pharmacy in the Coombs Health Hub. There is now a petition to ask the commonwealth health minister Greg Hunt to use his power under the National Health Act to approve the pharmacy. You can find the petition on Facebook – “Pharmacy for Coombs”. However with the release of these artists impressions it has been confirmed the outdated design was the cause of the delay. If you think this design is bad, you should have seen the original two designs that vaguely resembled a cheap 70s mausoleum. Great to see this finally come together, though. It’ll be nice not to have to drive 10 minutes for milk and bread at Cooleman Court. Pleased to hear there is finally a delivery date in sight for this much needed shopping complex however with the release of these artists impressions it has been confirmed the outdated design was the cause of the delay. How this company was approved to put their stamp on one of Canberra’s most promising new areas is a travesty.